Matai Ready to Go Singlets are a range of Premium Quality Products which are held in stock by our supply network in set colours, styles and sizes. Most garments are available in Men’s, Women’s and junior sizing. 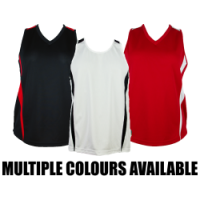 Matai Sports Range of Ready to Go Singlets are designed for quick despatch, to help your team or organisation dress smartly and comfortably. We have an array of recommended fabrics to suit their purpose and location of use. Simply select the design and the colour choices and we’ll gladly assist in the application of your club or corporate logo. Crafted from quality materials and available in a wide variety of sizes. Our Ready to Go Singlets can be quickly personalised with short turnarounds due to their ready made nature. Our Ready To Go Singlets can be customised through embroidery or heat press prints with club, schools and sponsors logos, along with individual names and numbers as required. Partner with our Ready to Go Hoodies, spray jackets or tracksuits and you’ll have a completely branded look for your next event or sporting occasion. Dispatch of our Ready to Go Singlets can be made within 7 days without embellishments. Dispatch of our Ready to Go Singlets can be made within 14 days with embellishments.